Updated: April 15, 2019, 6:10 p.m.
Every golf fan will remember where they were Sunday when Tiger Woods drained his short bogey putt for a win few, if any, thought we’d see from him again at Augusta National. Clad in his trademark Sunday red attire, Tiger buried a putt the distance he’s made thousands of times before. However, this time it sent the entire gallery on a slippery Augusta National course into a frenzy and framed the entire national conversation about golf’s greatest comeback at the Masters. This was major No. 15 for Woods, more than two decades after his first win at Augusta National and what seems like a lifetime since he took the sports world by storm in the late 1990s. Tiger’s comeback was never supposed to happen. At least not at this magnitude. The gap since his last win at the Masters (2005) and at a major (2008) was filled with back surgeries and transgressions that put more wear and tear on Woods’ body than most at only 43. However, just like every big win before, Tiger looked fit and focused as a new generation of fans were able to see him win with a fist pump on No. 18 in Augusta. Woods was deemed broken after his DUI arrest and subsequent conviction in 2017 for reckless driving, reportedly due to pain pills as a direct result of trying to fix his ailing back. Nobody could have seen the mug shot that night from his arrest, thinking we would see Tiger take charge again during the final round of the Masters. However, he was about to piece together his crowning moment, walking to the green on No. 18 with a two-shot lead and family waiting in the wings to celebrate with warm embraces that were felt by fans around the world. Tiger was back. On the biggest stage. Playing his best. On Sunday, Tiger continued to wear down the rest of the field as he shot a final-round 70 and took advantage of late mistakes from his closest contenders. This was the golfer that galvanized the entire country when he completed his career grand slam at the age of 25 and won his fourth Masters championship way back in 2005. Fans watched and cheered from their couch or favorite chair Sunday as we all witnessed a sports achievement no less spectacular than Hank Aaron breaking the home-run record in 1974 or Cal Ripken Jr. setting the new record in 1995 for consecutive baseball games played. 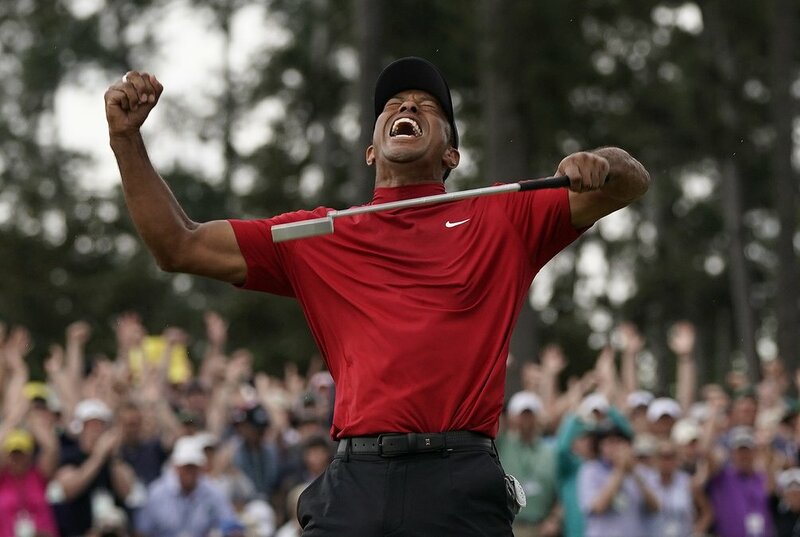 To me, Tiger’s win in Augusta is the greatest moment in sports history. I might be on an island by myself with that one. Every golf fan I know between the ages of 35-45 was doing cartwheels when Woods took the lead outright on No. 15 with a two-putt birdie, surging past Francesco Molinari, who led after 54 holes, but double-bogeyed the same hole. As Tiger maneuvered the final holes in Augusta with that steely gaze in his eyes, it reminded fans of so many times before where Tiger was untouchable. The final four holes for Woods included a well-played fairway shot on No. 15, a perfect tee shot on the par 3 16th that came to rest only two feet from the cup, and a roaring drive on the final two holes that left no doubt it was his Masters. And as Tiger celebrated, the sports world made it clear they were on his side. Woods let out his most emotional reaction to winning, before greeting his mother, two children, and legions of friends with sentimental hugs to highlight the greatest turnaround in sports history. The fallen hero was now back on top. As soon as he won, social media erupted with commentary from golf enthusiasts and casual observers, alike, proving when Tiger Woods is at the top of his game, nobody is bigger in sports. Tiger’s biggest fans didn’t think he would win again in one of the four majors, but we all got a glimmer of hope when he won the 2018 Tour Championship at East Lake in Atlanta. But the Masters brings on nostalgia like few other events. Tiger won it in new fashion, winning a major for the first time after trailing through 54 holes. Tiger, now a middle-aged man, still has it. He’s got a bald spot on top of his head and has to feel the wear and tear of all the medical procedures to his back, which just two years earlier made it hard for him to make it up the stairs at Augusta National for the Champions Dinner. Now standing at 15 major victories, Tiger is just three short of the great Jack Nicklaus. Father Time has certainly caught up with Tiger, after going 11 long and treacherous years since his previous major victory, the 2008 US Open at Torrey Pines. He’s got a pronounced bald spot on the top of his head. Wrinkles have started to set in on his face. However, nobody can take away the greatness of the moment when Tiger reached the top again. It was Tiger being Tiger.